For best results, get a workout buddy! Let’s be honest, starting a new fitness regimen is easy. Keeping it going is really, really hard. With today’s fast-paced, multitasking, almost frenetic daily schedule stealing every spare second away, the workout can easily become a casualty. After all, catching up tomorrow will be fine, right? Wrong! Although everyone is different, and we all have our own ways to keep on track and disciplined, one common problem is a tendency to take care of ourselves last. That’s why having a workout buddy can make the difference between an endless string of best intentions and a truly successful, long term fitness program. After a grueling day, we might be willing to pass on our workout to gain a few minutes on the couch, if we have a workout buddy expecting us, we will show up. Our natural drive to not let someone else down will make the “couch vs. gym” calculation come out differently if our buddy is expecting us. A workout buddy can be a constant source of encouragement and support, a sympathetic ear when yesterday’s squats made today’s walking a chore, and someone to share the celebration when a milestone is reached. Having a workout buddy means half the pain and twice the celebrating. Finding a workout buddy can be tricky. The ideal buddy has similar exercise goals and workout schedule. A compatible “talk/work” ratio is important, too. Some people are lucky enough to have someone within their core circle of friends that fits the bill perfectly. For many others, though, finding a workout buddy can be almost as hard as deciding that it’s time to get in shape. For a woman, finding a workout buddy can be especially challenging. Most on-line “find someone” sites are aimed at finding that special someone. But a workout buddy is not a date. Perish the thought! Observing the difficulty that many people (especially women) had finding a buddy for exercise and activities led to the creation of WannaBuddy. This new web site (www.WannaBuddy.com) is dedicated to connecting new buddies through activities. The site features a location database with thousands of parks and hiking trails, bowling alleys, golf courses, camp grounds, wineries and museums. Plus, it has over 100,000 upcoming events that can serve as rewards when fitness goals are met! 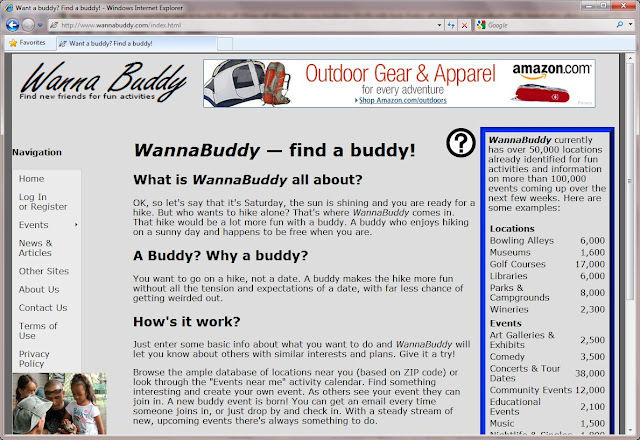 The WannaBuddy site allows free, safe and anonymous connections for exercise buddies. So what are you waiting for? Get a workout buddy and get your fitness program back on track! 1. Dancing. Regardless of what kind of music genre you like, it’s compulsory to dance like an idiot at concerts. For rock, there’s the head bang and mosh pit- who will have your back when you get sick of that thirteen year-old elbowing you in the sternum? Even something tamer, like bluegrass, involves a certain amount of foot tapping and chewing of straw that just doesn’t seem appropriate alone. 2. Food options. You can tell the popularity of a certain song by how long the food line is. When the “Side B”, experimental, or elevator music comes on, you will want to rush that corn dog tent along with hundreds of others. However, when alone, you will also face the dilemma of saving your primo spot in the crowd or tucking into sketchy meat on a stick. With a friend, you can play Angry Birds on your phone in the line knowing that your spot is safe. 3. Picking up dates. It’s common knowledge that concerts are the playground of recent divorcees, groupies, and singles sharing your obscure taste in music. But what happens when you have no wingman talking up your extensive, if not a tad obsolete, record collection? Who will distract the messy fake redhead so you can flirt with the chick in the “I Heart Sandman” shirt? 4. Bathroom complications. Etiquette at concerts is questionable at best, but it is still considered unacceptable to carry your drink into the bathroom with you. Even though it’s the best substance in there, your Sprite is unwelcome and you need someone to hold it for you. Better not hand it to Hulk Hogan’s less attractive cousin on your left, or that kid compulsively thrashing his Bieber haircut around on your right. 5. Photo ops. Let’s pretend that you’re hanging out between sets at the T-Shirt booth, eyeing up the overpriced merchandise and complaining about the cell phone service. Out of the corner of your eye, you see Rock God of Choice/Jazz Deity/Acoustic Wonder. Who will quickly snap a pic of you pointing over your shoulder at the celeb? Self-timing a photo of yourself will not only take considerable skill at a time when you may not be too coordinated, it will also look creepy and desolate on your Facebook wall. 6. Carpooling. The green movement (ahem, the recycling one, Burning Man vets) has spread to the music scene. The best way to look cool, save gas money, and enjoy some pre-show mix CD’s of greatest hits? Carpooling. 7. Rock ballads. Speaking of greatest hits, it has become commonplace to screech out your band’s hit song along with them. You paid upwards of fifty bucks to do what you do in your bathroom mirror, accompanied by a band. You may as well share you Air Microphone with a friend. 8. Clothing choices. For ladies, concert attire is often a battle between Scandalous, Dirty, and my personal favorite, Lawbreaking. If you go with a friend, you can rock those acid washed Daisy Dukes together. I’m sure Metro Police will enjoy your coordination, and you can always blame each other for the Caution-Tape-As-Shirt faux pas. 9. Safety net. There’s a fine line between B.A fist pumping, and your fists in someone’s face landing you in jail. A friend will gently smack you out of whatever Rush-induced stupor you fall into, and hold your bag when the fight inevitably comes. Plus, what’s the good of being arrested without matching mug shots for the road? 10. Unadulterated joy. The bottom line of the matter: if you can’t find a single person who shares your taste in music, you probably should stop with the Psychedelic Sitars and listen to the radio. Concerts are a great bonding experience, a full workweek’s worth of inside jokes, and several pairs of beer-stained shoes to be had. Enjoying it with a friend can take your average head nodding to an overemotional air guitar solo recorded on your phone for posterity. Who doesn’t love an incriminating tagged photo and a night to remember? Whew! It's been a lot of work and massive doses of humble pie, but WannaBuddy.com is LIVE! We even have registered users. It is amazing how much groundwork is required to stand up a functional data-driven website, but the market demands value for every click, so we knew that we needed to provide that value. So, we have over 50,000 fun locations and more than 100,000 upcoming events in our database, all searchable by zip code. That way its easy to find somewhere to hike or a band to see play live. With the WannaBuddy community, people can find others nearby who share their passions. Not a dating site at all. This is truly for those situations that are more fun with a buddy than going it alone. Take a look at WannaBuddy.com and tell us what you think!